Summer is almost upon us. What’s a better snack in the warmer times of the year then fresh vegetables dipped in ranch dressing? Of course, veggies aren’t as awesome as junk food but since most stoners these days are pretty health conscious, I figure that a few of you could definitely use this recipe yourselves! The dressing can also be used on salads, sandwiches, or any other cool summer snack. It only takes a few hours to make so even the most stoned stoner can prepare and enjoy this medicated ranch dressing. Take all of your fresh ingredients and place them in to a medium sized mixing bowl. Mix everything together for about ten minutes, making sure that everything is well blended. It should have the consistency of normal dressing, creamy and smooth. However, if you like your dressing to be slightly more or less creamy, you can adjust the recipe as you see fit. Don’t forget to add in the salt and pepper also. Once the dressing tastes right, place the bowl in the fridge for at least two hours before you serve it. 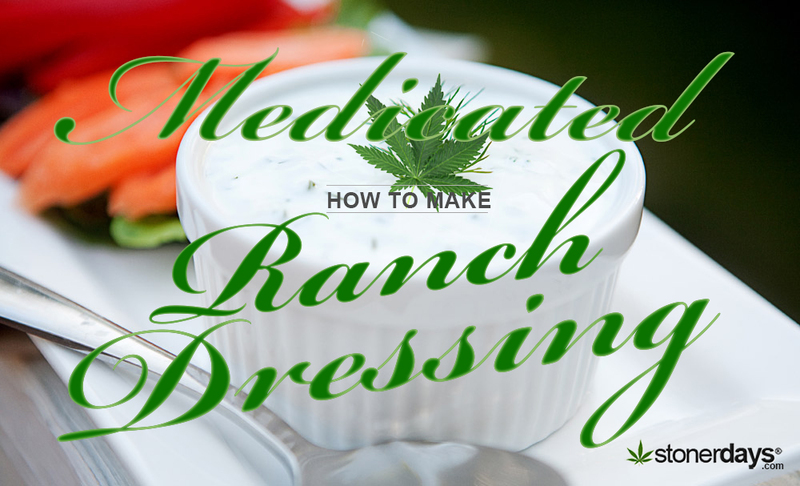 Enjoy your medicated dressing! This entry was posted in Stoner Blog, Stoner Cookbook and tagged medicated, recipes.